Yesterday was the official Day of DH because these people said so. I spent part of the morning cleaning up my website but dedicated most of the day to making transitions to a class I’ve taught for 15 years, and which has shifted digital bit by bit, but this coming semester will take a few bigger steps toward that world. I recorded the events of the day, or more accurately the thoughts of the day, here. Planning to return to this intermittently through the summer, especially in context of thinking of new assignments/student work for the class. But for now, back to editing the big project. 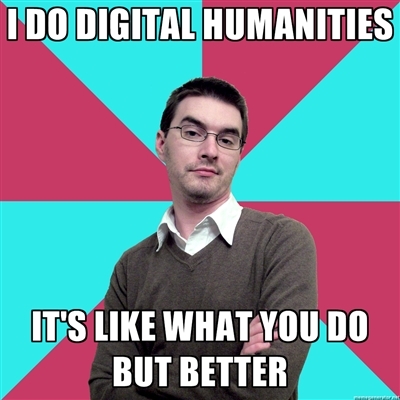 I’ve been home from the digital humanities institute for about a week and a half now. I spent part of that time just adjusting back to civilian life, including doing all the laundry I brought back from Fairfax, getting used to cooking for four again, filing papers, and pulling weeds (literally and figuratively). But I’ve also been trying to wrap my brain around the two biggest events of the summer–the DH institute in July and the trip to Turkey in June–in a way that will help integrate those experiences into the places they belong (and that in itself is a question), while also reflecting on them in a way that hopefully embeds them into my lifelong experience. Although I covet the regularity of the research/writing rut that I anticipate will be the general character of this sabbatical, I don’t want to lose, and forget, what has happened during this amazing summer. I started in a very practical way, using my newly-won DH skills, such as they are, to organize my Turkish experiences and materials for a future presentation at the Niagara Foundation (organizer of that tour) and also for my future classes. I’ve got a joint StoryMap/ThingLink project underway for the Ottoman patrons, but that is taking more time and brain cells than I have had to devote to the project (so, more on that later). An easier task was to use the Google Maps Engine to work up a map of my first course in architectural history. ARC 231 covers the ancient and medieval periods, and I began with the simple idea of putting together a map that showed the location of sites that the course includes, in part to show the extent to which Turkey was included in the class by means of comparison with the adjustments after the Turkey trip. Although it wasn’t the quickest thing to draw up the Excel sheet that listed all the buildings with their metadata (a word I wouldn’t have used a month ago, BTW), once the spreadsheet was “tidy” the map pretty much made itself. Because of the limitations of the free version of Google Maps Engine, I had to break the class in half; the point “0” that separates BCE and CE/AD timeframes seemed a reasonable place. Then, each map is further divided into three layers that show successive chunks of time. By clicking in the menu that appears in the map, you can turn on/off the successive layers; zooming in and clicking on a pin will access the site’s data and access to a few pictures of each building or site. If the Google system was a little more flexible (which maybe it is if you’re willing to pony up for the not-free version), and the pictures were a bit bigger, this would be a killer study tool for my students. As is, it is still pretty great in simply locating the buildings and gathering basic info on them. But more importantly, the map project accomplishes several goals that are at the heart of DH work: the map makes it much easier to literally see the big sweep of settlement patterns, understand adjacencies and, with a little more work, knit it all together through trade routes and other information networks. Yet at the same time the maps, like all visualization techniques, have a truthiness problem. In the institute we read from a great little book, How to Lie with Maps. One might see my maps giving a false impression about Where People Built Stuff–whole continents appear barren, which is, of course, not the case. Even zooming in to well-pinned countries or regions show that there are very few things that appear to be worthy of note. But therein lies the not-lie of these maps, because they are telling the very important truth of history’s long biases in favor of and against different cultures. And that, perhaps, is where I see these maps having truly transformative effect in my classes. Sure it will be handy for students to click around and find tidy dates for all the most famous things in Rome or wherever, but when we start the semester by looking at these maps and asking what they show, and what they don’t show, and WHY: well then. I might just trick those sophomores into thinking like historians if they’re not careful. Note: the map above is linked to the Google Map for the second half of ARC 231 (ancient/medieval architecture after the year 1 AD). Click on it to go to the map, have a look around, and please let me know what you think! On my one free day from our digital humanities institute at GMU, I did what virtually everyone else in the group did: made haste for Washington to spend the day looking at art (and, for a few of us, the buildings that the art hangs in). In the Smithsonian American Art Museum I saw a lot of old friends–sculptures and paintings that I have seen over and over during previous visits to this wonderful museum. 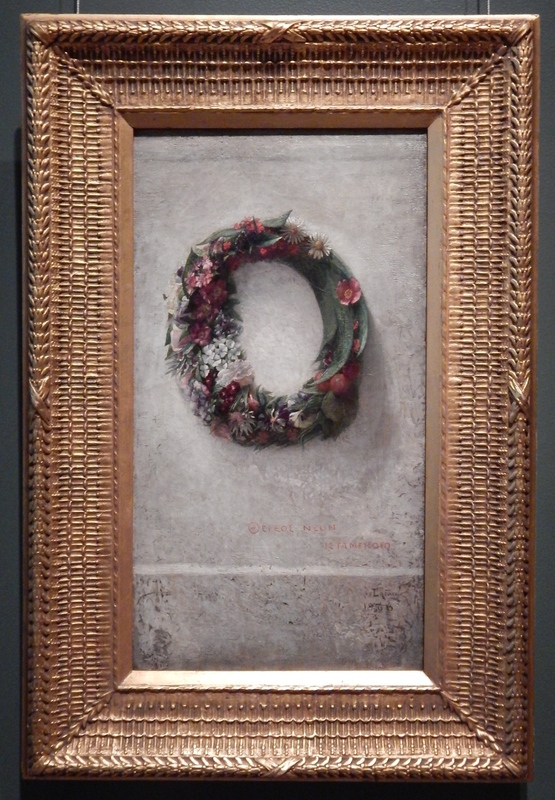 One of them was the La Farge painting above, which is a small and lovely thing; its size and prettiness, and the fidelity with which they are painted, surely must delight any eye that falls upon it. It certainly does mine. But additionally, it takes me back to my first-ever art history class. I was completing my M.Arch. and had decided to go on for a Ph.D. in architectural history and was advised to take all the art history I could fit into my schedule in preparation for grad school, where I would rub shoulders with Real Art Historians. The first class that fit my schedule was a course on American Art during the Reconstruction, taught by Dr. Katherine Manthorne. This might be a strange place to start, since it is pretty specific in time and place, and carries with it a host of issues above and beyond and connected with the art. With many courses in architectural history under my belt, I knew just enough to be able to follow along with the method, but also, it was new enough that some of the concepts were truly mesmerizing, even thrilling. It’s not that I went in there thinking that the raison d’être of painting was to be pretty and that’s it, but the depth of meaning that Prof. Manthorne spun out of, and read into, the works we studied was truly eye-opening–or maybe I should say, mind-expanding. I remember her analysis of LaFarge’s floral still lifes pretty clearly, and the lessons of their place and deeper meaning in post-bellum America not only makes me appreciate the paintings, but also reminds me how great art history is–and although I nibble around its edges, it’s a different thing from what I do with buildings. Revisiting this painting, in this week, was also special in that it reminded me of that first time I really remembered thinking hard (I should say critically) about context and meaning: the difference between understanding the related information about a thing and being able to visually analyze the thing itself. These are distinct, if interrelated skills: one addresses that which meets the eye; the other requires lots of background knowledge and insight. We’re revisiting that divide in our study of the digital humanities. I have a growing sense of what tools might be used to understand the elements related to, but beyond the buildings themselves: data-mining architectural theory and contemporaneous newspapers, mapping the movements of an architect through the country, charting the rise and fall of certain client types and building uses . . . this coud be all really, really useful, but it’s not about the building themselves. They still require an eye and a mind trained by deep experience. Although images of paintings and buildings might be reproduced, catalogued, and tagged, the most important aspects of them cannot be sifted down into a code. At least, that is what I think right now, in my burgeoning personal theory of the role that digital technologies can and should take in my architectural-historical work.